A few days back I featured a new small painting that is headed to the West End Gallery for next week’s opening of their annual Little Gems show. That piece, and never looked back…, was a stark image in tones of black and gray that was about the idea of being forced from your home, never to return. It’s a depiction of that moment of leaving and the sense of loss and abandonment that remains. 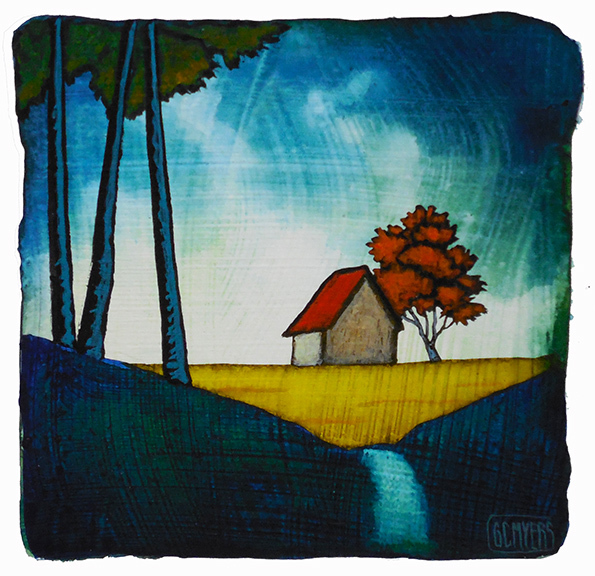 The new painting above, also headed to the Little Gems show, is another take on the idea of abandoning one’s home. This piece, One Last Look, speaks to the nostalgia that appears after time, as memories of bad times and the accompanying anxieties have faded and singular moments of happiness have grown to fill all the moments of that time. Time has smoothed away the rough edges and we begin to think that that time, that place, was much more idyllic than it ever was in actuality. To me, this painting speaks to that nostalgia and its idealized sense of home and youth. With nostalgia, the past seems more vivid and vibrant. The grass was greener then, I guess. I am reminded of a post I wrote back in 2009 where a large poll taken at that time throughout Russia named Joseph Stalin as the third greatest Russian of all time. I wrote: Despite the many millions, yes, millions of Russian citizens who were put to death by Stalin, despite the political purges and gulags and Soviet policies that caused a type of artificial famine that killed far more citizens than any natural famine more than once, the current populace said that this Man of Steel was their guy. Some of those polled had lived through the Stalin era but time, and a little more food and comfort now, had eroded the memory of the hardship, the famines and the purges. In fact, Putin had began extolling the virtues of Stalin about that time and many of these people felt the country needed that type of autocratic leader again. In Putin, they– and, unfortunately, we as well– may have found him. We all often fall prey to this sort of nostalgia, our memories holding onto a few events of happy triumph here and there through time and discarding the much more numerous days and weeks and months of chaos or drudgery that many of us live through. Nostalgia is like a beautiful double-edged sword– both wonderful and terrible. Such things should be handled with care.